We could hardly wait to finish this morning’s game and get back to her place to watch Eugene Levy, Chris Elliott, and Catherine O’Hara’s latest offering, Schitt’s Creek. (Unbelievably, my “AT&T U-Verse every-channel-in-the-universe FIOS package” that Dave Dorman demands we subscribe to–for the low, low price of a compact car payment–doesn’t carry the POP Network). The town sign says it all…and I SO want this if it’s ever a t-shirt. From Episode 1, we soon discovered Daniel Levy is an absolutely adorable comedic delight. Now I must see everything else he’s done. removes the doors from the Rose family’s motel rooms in a snit and Moira Rose (Catherine O’Hara) remarks that their open-to-the-world rooms are “like a Moroccan Fair,” Marovich and I were gasping for air. The writing is smart, quirky-funny, and I can’t help but embrace any show that really uses a nuanced comedy stallion like Chris Elliott (or Andrea Martin, Dave Thomas, Joe Flaherty or Norm Macdonald, for that matter). God, how I miss SCTV. Can you tell? 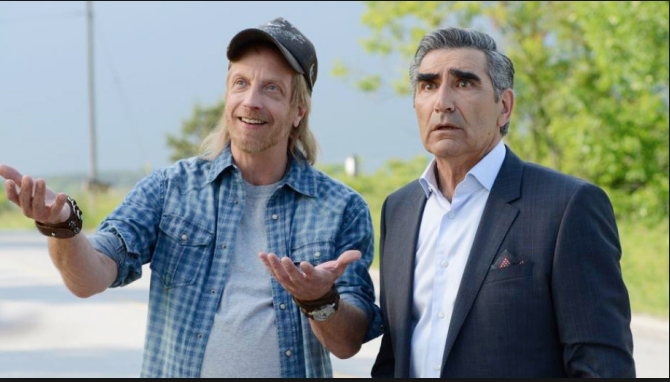 I hope you have a chance to check out Schitt’s Creek on the POP Network (formerly TVGN) and if so, you can share which line(s) made you laugh the hardest so I can relive them all over again. This show lives up to its every creative and on-board talent promise. WATCH IT.